We were hungry, and I thought fast, and this is what I came up with, “Quinoa Tuna Patties.” Quinoa is a gluten-free whole grain, will actually it has been simulated to be called a whole-grain. Quinoa is the only eatable plant grown for consumption that has the perfect balance of all 9 essential amino-acids essential for human health. The only other food that is eaten with all 9 amino-acids is beef, poultry, and pork. meat. 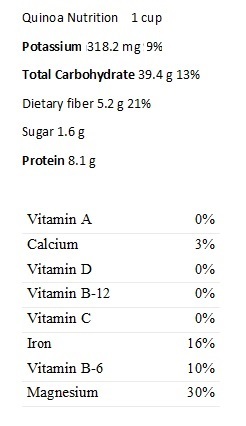 It also contains some vitamins and minerals as shown in the Quinoa Nutrition label image. It is recommended to rinse quinoa before cooking it. Why? Because the seeds are coated with saponin which is a bitter substance that protects the seeds from predators. However, most packaged quinoa sold in the U.S. has been pre-rinsed, but taking the side of caution is best. Tuna when purchased fresh will contain between 22 and 24 grams of protein. The “yellowfin” has the most protein from all ocean harvested tuna. If purchasing canned tuna, keep in mind it is pasteurized during the canning process. If the meat is dark, 100 gram serving has 25 grams of protein, were as white meat tuna has 23 grams. Tuna also provides essential amino-acids. Both quinoa and tuna are secondary sources of energy (complex carbohydrates are first) with their primary purpose, being to build muscle, and protect the integrity and health of human cell tissue. This meal can also be prepared in 30 minutes and is also considered a Salad as a Main Course, because of having a meat mix in with it. 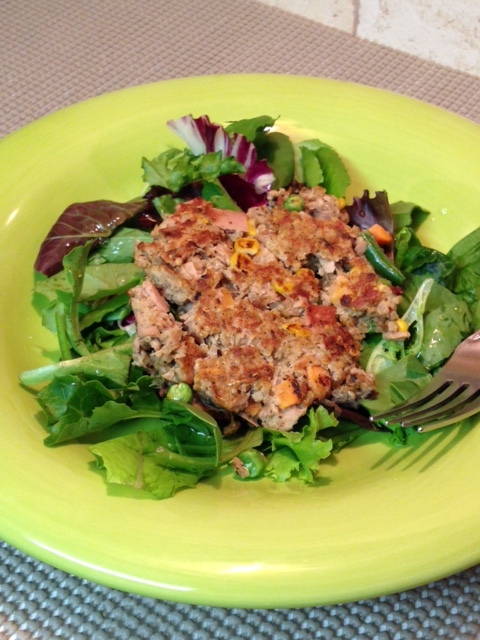 Now for our featured recipe: Quinoa Tuna Patties, and here is what you will need. Vinaigrette for leafy greens to follow. 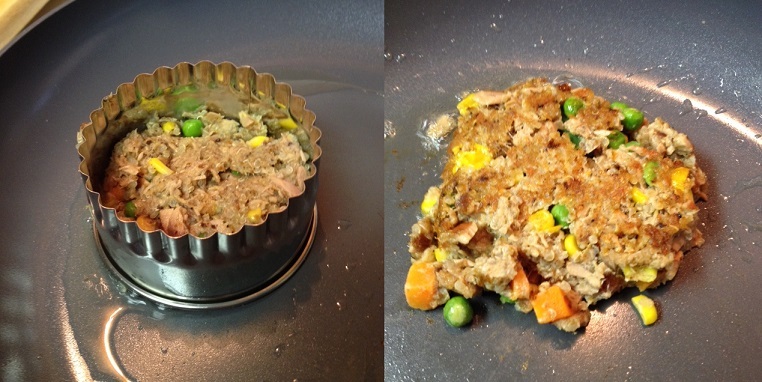 Cook quinoa according to package instructions and set aside. While you are cooking the quinoa, heat some water to boiling, place frozen mixed vegetables into a large bowl and pour hot water over them for about 2 minutes, or until thawed out. Drain off water and set aside. Open the cans of tuna and drain off water. In the large bowl with vegetables add tuna, eggs, salt, garlic, and bread crumbs. Mix together until well incorporated. You and either form a ball of tuna mix with your hands and fry in a large heated skillet with avocado oil or as we used a cookie cutter, to form the tuna patties. We only used one egg, therefore it did not hold together well. Next attempt at this meal, we will use two eggs and possibly 1/3 cup of bread crumbs. Cook on both sides just enough to warm the ingredients and cook the eggs, about 2 minutes on each side. Mix in a small jar 1/4 cup ginger syrup (purchased at Natural Grocer’s, or your favorite health food store), 4 tablespoons avocado oil ( a 1 litter bottle at Costco is $9.79 – 2014) and 2 tablespoons rice vinegar. Place lid on jar, and shake. 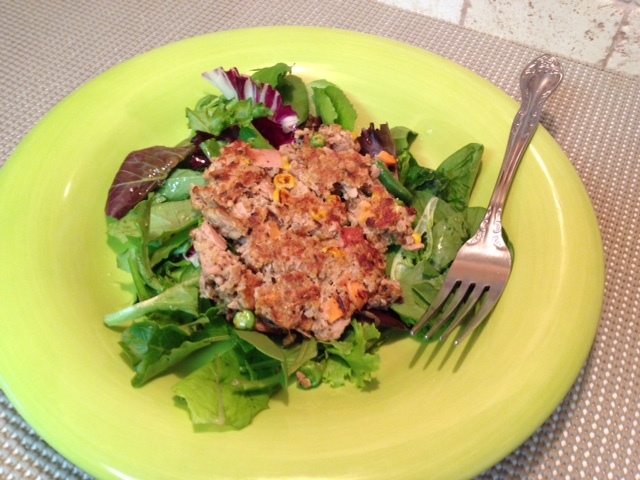 Plate leafy greens, drizzle vinaigrette over greens and top with a Quiona Tuna Pattie, and serve. Kaniwa, Considered a New Superfood! This entry was posted in Fish, Main Dish, Meals in 30 Minutes or Less, Salads as a Main Course and tagged Acid, Alaska, Andes, Avocado oil, Blueberry, Bread, Cereal, Essential amino acid, glutenfree, leafy greens, Protein, Quinoa, Quinoa Nutrition, Quinoa Tuna Patties, Salvia hispanica, tuna. Bookmark the permalink. I an glad you approve Luis.